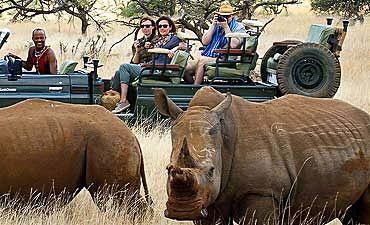 Are You Planning A Wildlife Safari To Kenya? 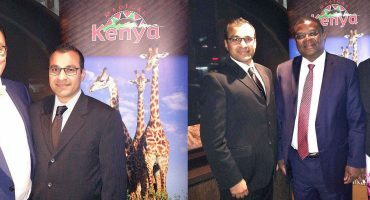 Scroll Down For Details..
Kenya is the quintessential African wildlife safari destination. In almost every designated wilderness location within the country, you see plains herbivores and carnivores engaging amidst rare and endangered species. The skies, floras and lakes are abuzz with birdlife, small and large, raptors, insects, plants and fruit eaters. 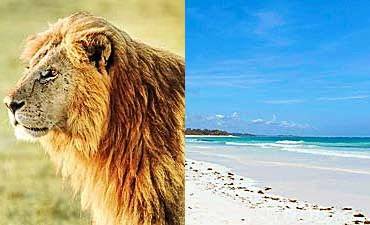 So AfricanMecca recommends that you bring along your wish list of terrestrial, aquatic and avi-fauna, and Kenya’s diverse wildlife will delight, surprise and thrill you! 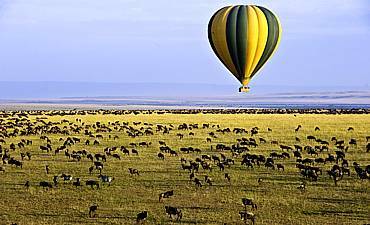 Heart-pounding excitement awaits in Masai Mara National Reserve and its private Mara conservancies, one of the premier Kenya nature vacation destinations! 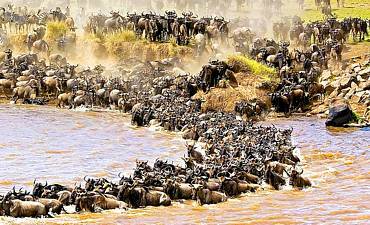 The massive Great Migration enters the reserve from July to October. 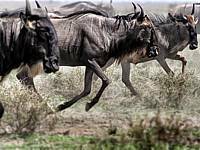 As over a million wildebeests and thousands of zebras, elands and gazelles traverse the landscape, the peaceful savannah plains are transformed into a thunderous hub of activity. The immense herds travel to the northern grazing grounds fed by the rains and fresh pasture, and their path is marked by the dust clouds that linger in the air. 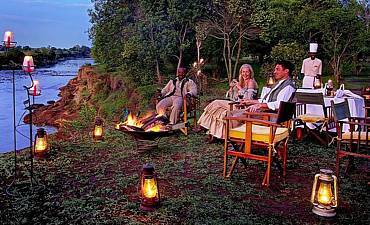 The journey is wrought with dangers and obstacles, including ever-watchful lions, leopards and cheetahs crouched in the grasses and the crocodile-infested Mara River taking the front row seats of the greatest spectacle on earth! Further south, the stealthy predators of Amboseli National Park give prey animals a reason to be nervous! A mother elephant moves her outspread ears forward, and without warning, she emits an almost deafening blast from her trunk. 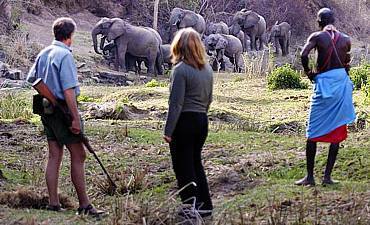 The other elephants in the family stop all activity and gather around the young calves. Two larger elephants break from the safety of the group and charge toward the tall grasses. 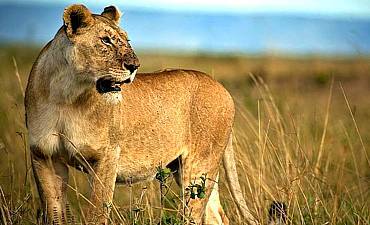 Suddenly, the lioness hunter scampers from its hiding place and runs the opposite way. With the threat to their young under control, the elephants settle back into their grazing. As the clouds clear the mountain during midday, you raise your camera to capture a spectacular scene – the caring, gentle giants against a backdrop of the snow-capped peaks of Mount Kilimanjaro in the borders of Tanzania. 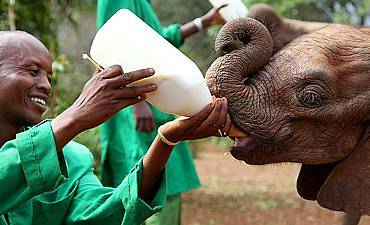 Mammals are not the only vulnerable species in Kenya! You have an opportunity to see rare feathered species, such as martial eagle, southern white-faced owl, palm nut vultures, tana river cisticola, yellow-billed oxpecker, hinde's babbler, williams' lark and many more. Hundreds of bird species have been recorded at Kenya’s lakes, making it a desired destination for superb avi-fauna tours in Eastern Africa. Even the conservation community is charmed by the Great Rift Valley ecology and animals of the lakes, earning some of them the prestigious UNESCO World Heritage Site, RAMSAR and Important Bird Area designations. Each lake offers a speckled birding experience, and one of the most incredible and awe-inspiring occurs at Lake Nakuru National Park and Lake Bogoria. The unique characteristics of the alkaline water promote the growth of special algae that is the genesis of one of nature’s most spectacular scenes! 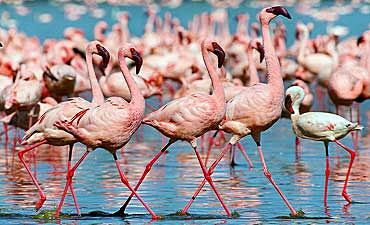 Millions of lesser and greater flamingoes feed on the algae, and the result is a dynamic pink feathered blanket. Watching such a mass of birds feed is quite awesome, but wait until the flock takes to the sky! 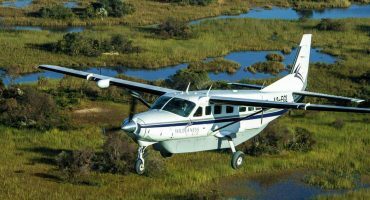 Similar birding experiences are found at Lake Elementaita, Lake Baringo, Lake Naivasha around the same vicinity to Lake Turkana in Sibiloi National Park to the far north and Lake Victoria to the far west. The iconic Mount Kenya is the centerpiece of Mount Kenya National Park and the Lewa Conservancy – both are also part of UNESCO World Heritage Sites. The impressive mountain may dominate the landscape, but the small creatures hidden amidst the lower slope forests of Mount Kenya take you into a discerning small-scale world! 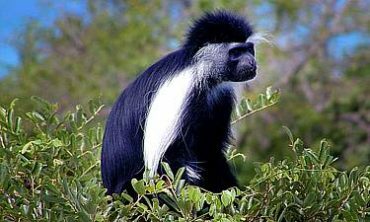 Olive baboons, black and white colobus and sykes’ monkeys intrigue you with their sapiens-like behaviors. Smaller denizens dart in and out of rocks and vegetation. 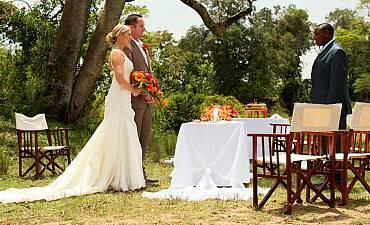 Perhaps you will see a rock hyrax, ruppell’s root rat, giant Kenya mole and other ground-hugging animals. 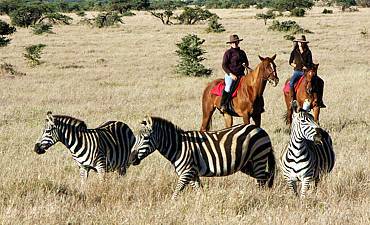 Take a moment, though, to take in the surrounding plains, montane and woodlands, because you may find zebras, buffalos, duikers, elands, bushbucks, waterbucks and other medium-size creatures! Journey with AfricanMecca further west into Aberdare National Park to locate rare bongos and giant forest hogs! Your safari exploration further east of Mount Kenya into Meru National Park may result in seeing lesser kudus, caracals and aardwolves. Sighting one of Kenya’s rare and endangered species roaming free and safe gives every guest a special Kenya untainted wilderness holiday! 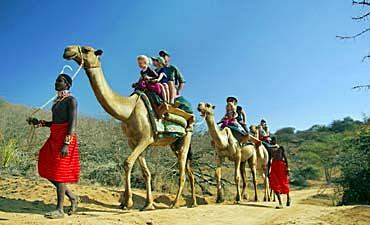 An enviable and memorable adventure such as this awaits you in northern Kenya! Private conservancies in Laikipia are notable for having the second-highest wildlife concentration in Kenya, but what truly sets the wilderness apart from all others is the presence of rare and endangered species – reticulated giraffe, grevy’s zebra, jackson’s hartebeest, beisa oryx, and many other rare species dot the landscape! 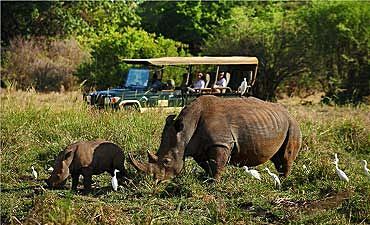 In fact, Laikipia is home to more than half of Kenya’s black rhinos and 70% of the world’s population of Grevy’s zebras! 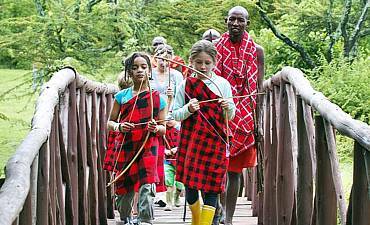 As you travel through an individual conservancy with AfricanMecca, watch for the distinct black and brown coats and oblong, round ears of a ferocious hunter – African wild dogs, thriving in this region! 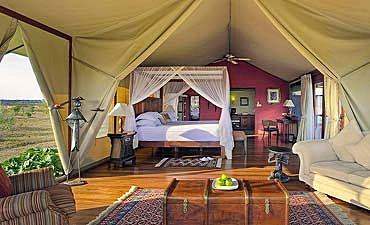 Further north-east of Laikipia, you can explore Samburu, Shaba and Buffalo Springs National Reserves. Here are a group of animals known as the Samburu Special Five – Somali ostriches, grevy’s zebras, beisa oryxes, gerenuks and reticulated giraffes amidst stalking predators. 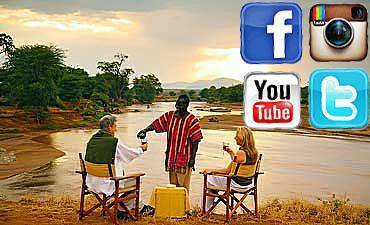 Watch the age-old story of predator and prey unfold right before your eyes in the wilds of Samburu. The agility and stealth of a lone cheetah builds your anticipation. Her eyes keenly fixated on a zebra foal, she awaits the perfect moment to strike. Only a few days old, the baby zebra is not aware of the dangers on the savannah and its inexperience is about to be challenged! You watch as the cheetah lies motionless peering through the grasses. Your heart races as you know the moment is near! The foal wanders too far from its mother and in a flash, the stealthy powerful cat captures a meal for her young cubs. Similar hunting experiences are available with leopards ambushing impalas and taking its prize up an acacia tree to get it away from fierce scavengers like hyenas and opportunists lions. 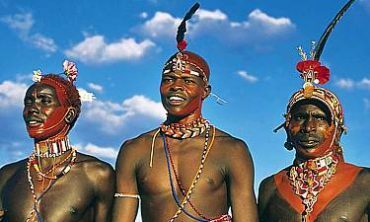 To the southeast bordering Chyulu Hills is Kenya’s Tsavo West National Park, one of the most magnificent biodiversity sites on the planet! 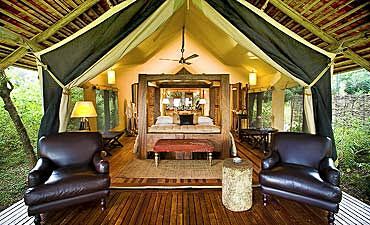 Along with its adjoining sister park – Tsavo East National Park, the wildernesses are part of the largest wildlife sanctuaries in the world. The elephant population in both the parks is one of the largest in the country, and these pachyderms dust themselves with the murram soil, transforming their grayish skin into a reddish-brown color. 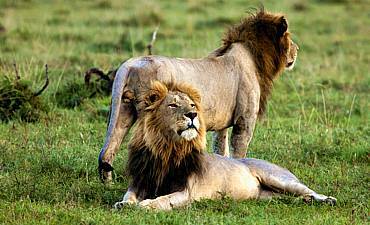 Tsavo Parks are also home to prides of mane-less lions along with its man-eaters trademark from yesteryear incidences! 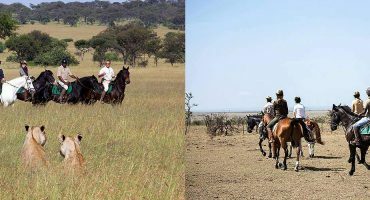 Even Kenya’s remote and largely desolate Northern Frontier offers wildlife viewing for your outback trip in East Africa. The highlands and more rugged parts of the Namunyak Conservancy and Matthews Mountains Range are home to varied fauna including elephants, giraffes, zebras, hyenas, lions, wild dogs, leopards, cheetahs and many other mammals! 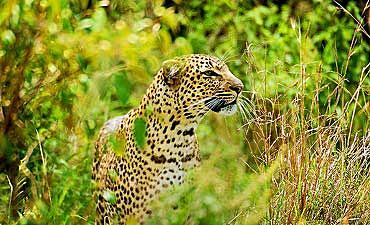 The wildlife experiences in Kenya are almost endless – spotted-neck otters at Lake Victoria, rare sable and roan antelopes in Shimba Hills National Reserve, bull elephants and other fauna silhouetted against Mount Kilimanjaro at Chyulu Hills National Park, more than 400 types of butterflies floating through the vegetation of Kakamega Forest National Reserve! 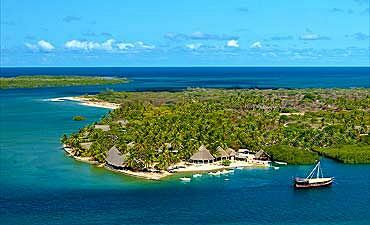 With such a diversity of wildlife across the country, Kenya has something for everyone for their dream safari!